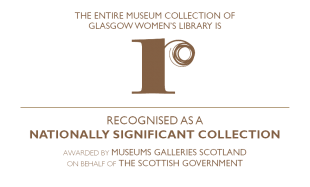 On 21st September 1991 Glasgow Women’s Library opened its doors for the first time, the offspring of Women in Profile, a broad based arts organisation that aimed to forefront women’s contributions to Glasgow’s history, life and culture during 1990 when Glasgow was the European City of Culture. The organisation has faced many challenges: economic downturns, feminist backlashes and waves of political turmoil have all generated degrees of turbulence that we have needed to overcome. The tenacity, ambitious vision and commitment of the GWL team, along with the support of hundreds of thousands of learners, visitors, supporters, donors, volunteers, creatives, funders, partners and Friends, has enabled GWL to grow into today’s beautiful, vibrant and welcoming resource. This timeline gives a snapshot of the history of Glasgow Women’s Library through photographs, archive materials and artefacts in our collection – many of these feature in our Recognition and Reflection: 25 Years of Collecting and Making Women’s History exhibition, on at GWL until 8th October. Please continue to be part of GWL for the next 25 years. We would love to hear from you – please do share your memories and thoughts of GWL with us. We will use the hashtag #GWL25, tweeting @womenslibrary.